The mechanism of how cytokines and growth factors elicit a signaling response via cell surface receptors remains a major question within the field of cell signaling. It was previously thought that dimerization of the extracellular domains was sufficient to elicit activation of a signaling pathway, and, indeed, a variety of studies have shown that a number of different strategies of dimerization can cause signal activation. 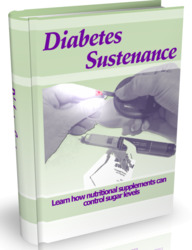 However, studies on the erythropoietin receptor (EPOR) have suggested that dimerization alone is not sufficient. Rather, subtle differences in ligand binding to receptor extracellular domains, as shown by various structural and biochemical data, can result in structural deviations that can modulate the signal response. Signaling of erythropoietin (EPO) through the EPOR promotes the proliferation and differentiation of erythroid progenitor cells and is thus crucial to normal red blood cell development [1,2]. The EPOR is a member of the cytokine receptor superfamily , which includes receptors for other long-chain cytokines, such as growth hormone (GH), thrombopoeitin (TPO), and granulocyte cell signaling factor (GCSF), as well as short-chain cytokines, such as interleukins (ILs) 2, 3, and 4. These receptors are single-transmembrane (TM)-spanning proteins that bind their corresponding ligands in their extracellular (EC) domains. A common motif among these receptors is the cytokine homology domain (CHD), which consists of two seven-stranded P-sandwich motifs connected by a proline linker. Signature characteristics within the CHD include interstrand disulfide bonds within the N-terminal domain and a WSXWS-conserved motif located in the C-terminal domain. This WSXWS sequence seems to be essential for productive ligand binding and the resulting activation of the EPOR [4,5], although it is not clear from the structural data how the WSXWS motif carries out any binding or signaling role. The cytokine receptors are coupled to members of the Janus kinase (JAK) family (nonreceptor tyrosine kinases) at a proline-rich sequence in their cytosolic (CT) domain called Box 1. 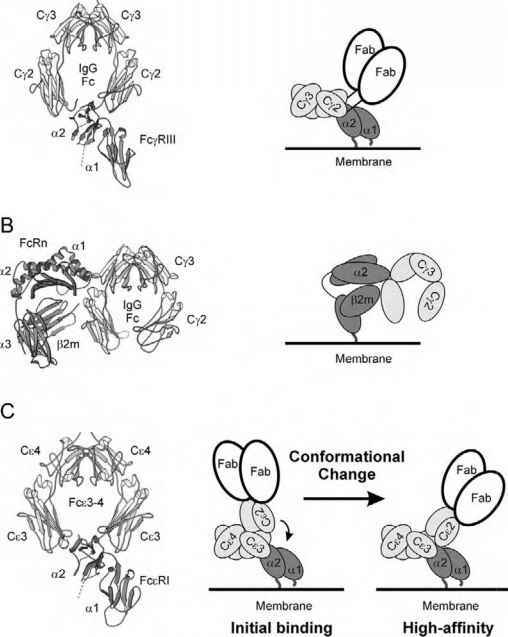 Agonist ligand binding in the EC domain of the receptor leads to a con-formational change and reorganization that is permissive for autophosphorylation and activation of the associated JAK, resulting in phosphorylation of the CT domains of the receptors. These phosphorylation events trigger a signaling cascade via the signal transducers and activators of transcription (STATs) that ultimately leads to protein expression and cell proliferation . In the case of EPOR, the associated JAK2 phophorylates many of the eight CT tyrosines, which serve as docking sites for STAT-5. STAT-5, after being activated by JAK2, travels to the nucleus, where it promotes genes that lead to the proliferation and survival of erythroid progenitor cells. Erythropoietin, similar to GH [7,8], binds to its receptor in a stoichiometry of 1:2. As EPO itself is not a symmetric molecule, two different binding interfaces exist on the cytokine surface which are each capable of interacting with the EPOR. The EPO interaction sites have been named site 1 and site 2, for which the binding affinities are 1 nM and 1 |M, respectively . Studies on the binding of different ligand molecules to the EPOR have shown that dimerization of the extracellular domains itself is not sufficient for a biological response . Furthermore, structural and biochemical data surprisingly revealed that the EPO receptor exists as a preformed dimer on the cell surface, and that a conformational reorganization of the receptor as a result of ligand binding is necessary to elicit the signal transduction cascade [11,12]. The biological appeal of a preformed dimerized receptor can be understood when one considers the low cell-surface density of the EPOR (<1000 receptors, or 1 yM) in vivo [9,12-14]. Clustering of the receptors allows EPO to act efficiently at the cell surface by binding to the high-affinity (nanomolar) site 1 immediately followed by interaction with site 2, despite its low micromolar binding affinity. In the absence of this clustering, monomeric receptor-EPO interactions would be prevalent. As a result, the efficiency of the biological response to EPO would be compromised. The extensive amount of crystal structure data available on a variety of agonist and antagonist EPOR complexes has enabled a comparison and analysis of different activation states of the EPOR. 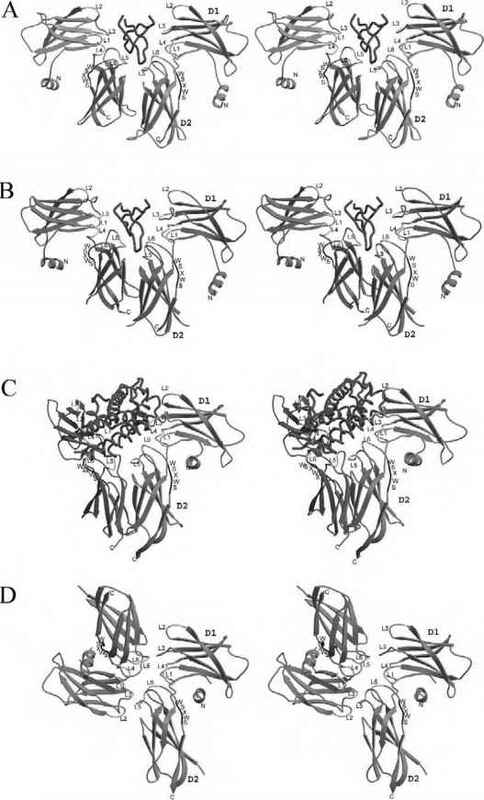 Four EPOR structures, determined by X-ray crystallography (depicted in Fig. 1), allow for the exploration of the dimerization interfaces involved in various signaling states of the EPOR [10,15-17]. These structures allow us to examine how differences in the nature of the bound ligand lead to changes in the receptor structure and assembly on complex formation. The crystal structure of an EPO mimetic peptide, EMP1, was determined at 2.8 A resolution in complex with the extracellular EPO-binding protein domain (EBP) of EPOR . EMP1 is a member of a family of peptide mimetics selected by the phage display method that bind specifically and with high affinity (100-200 nM) to the EPOR and have agonist activity . Co-crystals of the EMP1-EBP complex showed that EMP1 binds to two EBP molecules as a peptide dimer, resulting in a 2:2 ligand-to-receptor stoi-chiometry and generating an almost twofold symmetric assembly of the EMP1-EBP complex . In this arrangement (Fig. 1A), the monomers of the EBP dimer are rotated approximately 180° from each other, and the two domains of each receptor molecule, D1 and D2, are oriented with an elbow angle of approximately 90°. The EPOR dimeriza-tion interface in the complex consists almost entirely of interactions with residues from the peptide EMP1 dimer with minimal contact occurring between the receptors themselves. Studies on the EMP family of mimetics showed the importance of peptide Tyr4 in the peptide-mediated receptor dimerization . A substitution of 3,5-dibromotryosine yielded a biologically inactive peptide, EMP33. Surprisingly, this antagonist was capable of dimerizing the EPO receptor. The crystal structure of EMP33 at 2.7 A resolution bound to the EBP confirmed that dimerization is indeed not sufficient for signaling . The structure shows an asymmetrically dimerized receptor (Fig. 1B) in which the D1 domain of each monomer is related by a 165° rotation (in contrast to the two-fold (180°) of the EMP1-EBP dimer). Thus, only 15° of rotation distinguishes an active dimer from that of a complex that is incapable of JAK2 activation. Crystal structures of a mutant [10,20] of the natural highly potent cytokine EPO with EBP were determined at 1.9 and 2.8 A resolutions . This EPO-EBP complex binds in a 1:2 stoichiometry, similar to that of the GH-growth hormone receptor (GHR) complexes , using two different binding surfaces of the EPO molecule to mediate interactions with each of the EBP monomers (Fig. 1C). These two surfaces, denoted site 1 and site 2, bind the receptor with high (Kd = 1 nM) and low (Kd = 1 yM) binding affinities, respectively . The D1 domain of each monomer is rotated approximately 120° relative to the other. In this complex, the orientations of the D2 domains are approximately in the same plane perpendicular to the membrane, in contrast to the 45° angle of the EMP1-EBP complex. This allows for the C termini of the receptor in the EPO-EBP structure to be in close proximity. 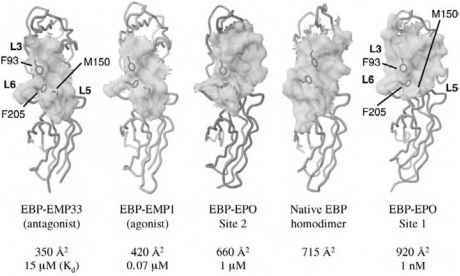 Furthermore, this complex confirms the large amount of flexibility associated with receptor assembly, which may explain how a covalently-linked EPO dimer is still capable of binding and activating the EPO receptor, presumably in a 2:2 complex [21,22]. An unexpected result surfaced when the crystal structure  of the unliganded EPO receptor was determined at 2. 4 A. The asymmetric unit contains an EPOR dimer, such that the dimerization interface is located near the ligand binding site (Fig. 1D). In this unliganded form, the D2 domains are oriented such that their C termini are rotated 135° away from each other  and at an angle to the plane of the membrane, placing their expected membrane insertion points approximately 73 A apart. The equivalent distances of the D2 C termini of the EMP1-EBP and the EPO-EBP dimers are 39 A and 34 A, respectively. These values are consistent with the notion that the inter-dimer distance of the unli-ganded EPO receptor would be too far for the intracellularly associated JAK kinases to interact, thus causing the unbound receptor to be inactive and locked into an off state. Clackson and Wells for the human growth hormone . Differences in Kd approximately correlate with the amount of surface area buried in each of the binding interfaces for the lig-anded complexes (Fig. 2). Thus, the EPOR is capable of presenting a number of the same interaction surfaces in different contexts for different ligands, each of which correlates with different activation states of the receptor. This example demonstrates that slight differences in the contact surface interaction can lead to a significant shift in receptor orientation, in turn propagating a much larger effect on the signaling response.